Photovoltaic (PV) systems are used to convert sunlight into electricity. They are safe, reliable, incur less operating costs, and are easy to install. The growing concerns about climate change and alternative sources of energy have led to the significant growth of the photovoltaic market. Incentives and funding provided by the government towards the adoption of solar energy to generate electricity have further added to this growth. Photovoltaic market in Asia, namely China and Japan are expected to contribute largely to the growth of the PV market, globally. This is mainly attributed to the initiatives taken by the government, the key market players being located in the region, and the emergence of building-mounted and ground mounted systems along with, the on-grid segment. On the other hand, the major factor hindering the growth of this market is the demand for high quality and low priced products. A successful PV installation provides power for over 20 years with no fuel costs and less maintenance. When compared to diesel generation in particular, PV is a cost-competitive option, especially in the current scenario where electricity and diesel prices are often high. Although PV technology is an appropriate choice for many applications in the market, high capital costs and poor installation and maintenance practices have been the limiting factors in the overall deployment of photovoltaics. The global photovoltaic market is expected to grow at a CAGR of 18.30% between 2014 and 2020 and the overall market is estimated to be worth $89.52 billion in 2013 to $345.59 billion by 2020 In terms of application, the utility application accounted for the largest market size in 2013 at 57%. The utility application is expected to hold the major market share and is also likely to grow at the highest CAGR during the forecast period. The main reason behind this would be the growing usage of photovoltaics in power plants, military applications, and other utility applications such as space & defence, industrial projects, and so on. The major players in global photovoltaics market are Kaneka Corporation (Japan), Kyocera Corporation (Japan), Mitsubishi Electric Corporation (Japan), Panasonic Corporation (Japan), Sharp Corporation (Japan), JA solar Co. Ltd (China), Jinko Solar (China), ReneSola Co. Ltd (China), Suntech Power Holdings Co. Ltd (China), Trina Solar (China), Yingli Green (China), and Canadian Solar (Canada) among others. The market by type for global photovoltaics market is segmented into Organic photovoltaic and Inorganic photovoltaic. The market by component for global photovoltaic market is segmented into cells which have been further bifurcated into crystalline silicon PV cells and thin film PV cells along with, Modules, Tracker, and Optics. The market by application for global photovoltaics market is segmented into Utility which has been bifurcated into power plant application, military application, and others (space and defence, industrial projects and so on) along with, Residential, and Non-residential. The report discusses the global photovoltaic market in four major regions namely: North America, Europe, Asia–Pacific, and Rest of the World (RoW). Geographical analysis in the report contains the in-depth classification of the market into the U.S., Canada and others for North America, U.K., Germany, Italy, and others for Europe, and China, Japan, and others for Asia-Pacific, and Latin America, Middle East & Africa, and others for the RoW. The report also identifies the drivers, restraints, opportunities, current market trends, winning imperatives, and burning issues related to the global photovoltaic market. 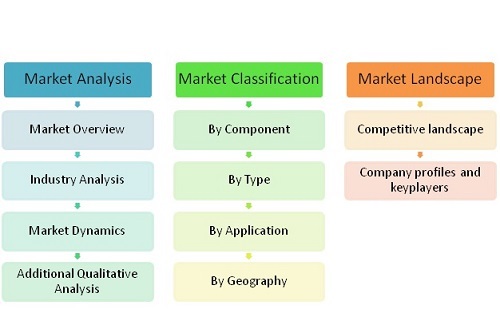 Apart from the market segmentation, the report also includes the critical market data and qualitative information for each component type along with qualitative analysis such as the Porter’s Five Forces analysis, market time-line analysis, market investment analysis, industry breakdown analysis, and value chain analysis. The figure below entails the aspects covered in the photovoltaics market report. Photovoltaic systems play a vital role in the energy industry and are expected to be widely utilized in various applications ranging from telecommunications towers to residential areas in the coming years. Solar photovoltaic electricity is being utilized as it requires minimum system maintenance, reduces the operating and maintenance costs, and is pollution-free. The PV market is observed to be growing at a rapid pace over the past few years. This is mainly attributed to the rising demand for energy, support extended by the government, and the growing concern regarding environment. The growth of the photovoltaic market is propelled by the growing energy costs and changes in climatic conditions. Furthermore, the growing importance of renewable and environmental friendly energy sources such as solar PV technology is driving the growth of this market. The photovoltaic market is also witnessing continuous advancements with respect to materials used in the manufacturing of photovoltaic components and techniques. Initially Europe was the largest and one of the most promising markets for PV, but currently it is at the second position due to various factors such as the 2012 European crisis which has resulted in reduced funding activities by governments and decline in the market expansion initiatives being undertaken by the players in the region. Currently, the major market share is occupied by the APAC region, primarily by China and Japan. This is due to the presence of the major industry players in the region and growing investment activity. The photovoltaics technology encompasses the process which includes the conversion of solar energy into direct current electricity. The various components that play a vital role in this market comprise cells, modules, optics, and tracker. The global photovoltaics market can be bifurcated into two major types namely; organic photovoltaic and inorganic photovoltaic. This report describes the market trends and challenges pertaining to the global photovoltaics market and forecasts the market till 2020, based on component, type, application, and geography. It covers geographies such as North America, Europe, APAC, and RoW (Rest of the World). The report also features a detailed competitive landscape along with, the identification of the key players with respect to the photovoltaic market, an in-depth market share analysis with individual share, and market share rankings. The sections and sub-segments in the report would contain drivers, restraints, opportunities, and current market trends, with respect to the photovoltaics market. The major players in the global photovoltaic market are Kaneka Corporation (Japan), Kyocera Corporation (Japan), Mitsubishi Electric Corporation (Japan), Panasonic Corporation (Japan), Sharp Corporation (Japan), JA Solar Co. Ltd (China), Jinko Solar (China), ReneSola Co. Ltd (China), Suntech Power Holdings Co. Ltd (China), Trina Solar (China), Yingli Green (China), and Canadian Solar (Canada) among others. Total Markets: Global photovoltaic market – Parent Market, Child/Sub-Markets, Related Markets, Complementary Markets (with sub-segmentation), Total Addressable Market (TAM), and Market Penetration of photovoltaics technology. Competitive Landscape: Market share analysis of the various players in the global photovoltaics market. The global photovoltaics market is expected to grow at CAGR of 18.30% between 2014 and 2020. The utility application is the major application in the global photovoltaic market, followed by non-residential applications. In geographic analysis, APAC has been observed to be the market leader followed by Europe. Table 73 New Product Development is Major Strategy Adopted By Panasonic Corp.
Table 74 Agreements And Participation in Exhibition is Major Development Strategy For Sharp Corp.